You met Jude Ouvrard on Monday. 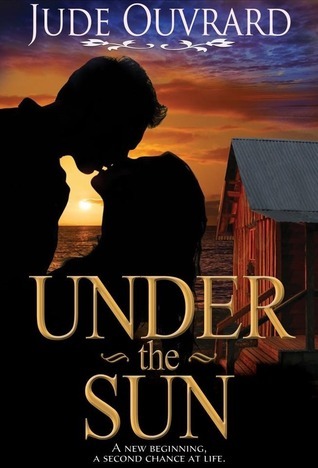 Now read a snippet from her romance novel Under the Sun. By the end of the afternoon, we had finished painting. To be honest, his help had made all the difference. He lent me a hand with the curtains and frames, too. Everything was finished by the time we took showers for our night out. I hadn’t expected to finish the painting in one day. More than anything, I had enjoyed spending time with Jackson. He joked around and made me laugh. He’d been in good spirits all day, and he had done an incredible job on the walls he’d covered. “It was my pleasure, Tracey,” he said, stepping up to me. My gaze danced between his eyes and lips. For the first time in years, I really wanted to be kissed. My heart fluttered in my chest, and from the way he looked at me, I wondered if he wanted it, too. Using both of his hands, Jackson cupped my face, and we simply stared at each other for a very long time. When he whispered, he was so close that the warmth of his breath lingered on my skin. I could feel the intensity of his words. He brushed his thumbs across the apples of my cheeks. I huffed when I realized that he wouldn't kiss me, which made him laugh. Jackson kissed my forehead. His lips felt so soft and warm. I knew that he meant well; that he wanted to wait for the right moment. My heart was falling in love with this man, and I couldn't help it — not that I wanted to. Jackson dropped his hands from my face and left to shower at his place. I stood alone in my freshly-painted living room with my heart pounding against my ribs. Feeling giddy, I danced my way to the refrigerator and ate a little bit of everything before heading into the bathroom to take a shower. I had to find something to wear. We were going to be walking, so I had to be comfortable, but I didn't want to under-dress. Heels were not an option. My sneakers seemed to be appropriate and would go with the denim skirt and black V-neck T-shirt I’d selected. The outfit was cute and simple. When I walked out the door, Jackson was sitting on the hood of his car, waiting for me with a beautiful bouquet of tulips. For the first time of my life, someone had brought me flowers. My eyes filled with tears, and my nerves felt like they were on fire. Jackson walked to me with the bouquet in one hand and his other hiding in the side pocket of his shorts. Looking at me through his pale lashes, his eyes simmered with desire, and he bit his bottom lip. My heart skipped a beat. I could picture him in a Ralph Lauren campaign; he was gorgeous and irresistible. “Thank you — thank you so much,” I murmured. “This is a first for me. I’ll never forget it.” I smelled them and closed my eyes, soaking up the emotion. “If you don't want them to wither, you should put them in water,” he suggested. He spoke to me in a soft voice, and his hand still rested on my arm. I was impressed by his courteous manners. “I’ll be right back.” I went inside to put the flowers in a vase. How sweet was he? Tracey Howard has put her life on hold for years to care for her grandmother. Now that her grandmother has passed away, Tracey decides to spend the summer at the beach and reflect on where she wants life to take her next. Jackson Phillips is her new neighbor, and he dazzles her from the first moment they meet. Will Jackson be able to show Tracey how to let go of old pain and embrace future happiness?